With Cakewalk by BandLab (CbB) now available as a free download, the number of people adopting it as their DAW of choice — or to supplement their existing DAW — has far exceeded BandLab’s expectations. If you’re new to Cakewalk, although you may need only 20 percent of what it does, you do want to be a power user in the aspects that matter the most, and accomplish specific tasks quickly. So, let’s zoom out and cover how to become a Cakewalk power user as rapidly as possible, and then close with some tips for all users. Click on every drop-down menu in every view, and look at every menu item. If you don’t know what something does, click on Help, and use the search or index function to find out. This will prevent suffering the fate of a long-time user who was unhappy that deleting a clip also deleted automation, because he didn’t know that ‘Select Track Envelopes with Clips’ is under the Track View Options menu. Or the user who couldn’t tell if notes were aligned with the grid (under the View menu, you can place the vertical grid lines in front of clips instead of behind them). 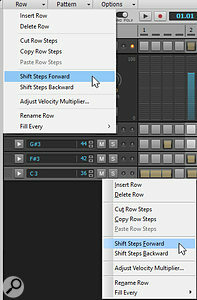 You can go up to the Row menu option to choose particular functions (top menu), but it can be easier to right-click on a step sequencer row (lower menu).Also check out the Step Sequencer’s drop-down menu for each Row. Options like Step Play Probability may be what’s needed to bring repetitive percussion parts to life. Right-click around Cakewalk to call up context menus, and look at every item on the menu. For example, the split options when you right-click on a clip and choose ‘Split’ are comprehensive. Or if you don’t know where a clip came from on your hard drive, or its resolution, right-click on it and choose ‘Associated Audio Files’. Sometimes you’ll find duplicate functionality, so you can choose whatever’s most appropriate for you. 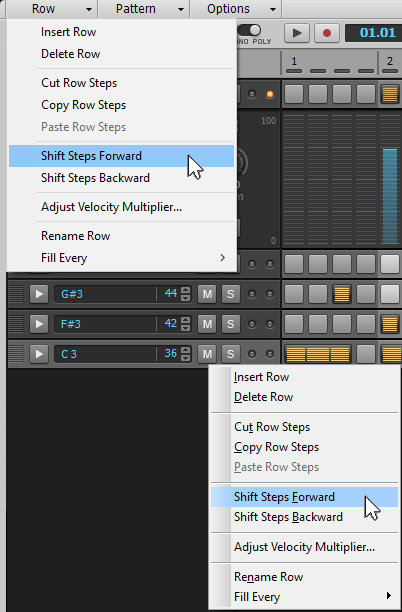 For example, to access the row options in the Step Sequencer, you don’t have to select a row, you can go up to the menu bar’s Row drop-down menu, select another row, go back up to the menu bar, etc. Just right-click on a row to access all the row options. Go through every Preference window and understand what all the options represent, because they can have a major effect on performance and convenience. If you don’t understand an option, use the Help button. Extra tip: if a notification says there’s been an audio dropout, click on its Help button and go through the recommended solutions until you find the one(s) that works. I did that once when I experienced dropouts: problem solved. Key bindings speed workflow. Analyse the way you work, then translate your common motions into keyboard shortcuts. For example, I often change gain with vocal phrases or use normalisation. So, I made keyboard shortcuts to bring up the menus for gain changes and normalisation, and can whip through a vocal file to even out levels really fast. Experiment to find out what different options do. For example, I first thought ‘Fit MIDI Content’ didn’t work because I was expecting the PRV and in-line PRV to zoom in or out to fit all the notes within the PRV — then I realized it fits MIDI content by zooming vertically. This is very useful for finding if Kontakt keyswitches (which can be a much lower pitch than the part itself) have been played. Trying different functions is also a way to learn features you didn’t expect to learn. I’m always surprised at forum posts that ask questions like “What happens if I do this?” Just try it and find out! Save a complex project with different data types as a test project so you can experiment with functions and new features, without worrying that you’re going to mess up a real project. Regular updates continue to roll out with Cakewalk, including bug fixes that lock down stability, and workflow enhancements. 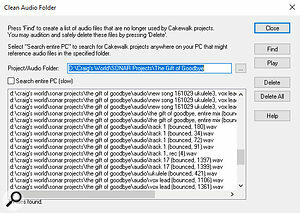 Although these new features are documented at www.cakewalk.com/Documentation, the descriptions don’t always go into a lot of depth. Let’s fill in the blanks. The time difference between the current and original Aim Assist position displays all visible time ruler units.Aim Assist Enhancements: When dragging across the timeline with Aim Assist enabled, the current time position now shows the difference between the original and current position. However, what’s not mentioned is that if you have more than one timeline ruler enabled, you’ll see the difference expressed in all the various units — measures/beats/ticks, milliseconds, samples and H:M:S:F. This is a dream come true if you do music for video and need to work with bars and beats, but also need to see how this affects absolute video timing. Renaming Clips: The latest update lets you name a clip by right-clicking on it, and choosing Rename Clip from a context menu. However, if a clip has been split into multiple parts, this option won’t appear. So, let’s re-visit other clip-naming options. If you select multiple clips, including clips in different tracks, the Clip Inspector will show the name as (Multi). Drag over this, type in a new name, and all the clips will be renamed. It’s not necessary to select an entire clip; if you drag in the timeline, and the selection covers even a sliver of a clip, it will be renamed. Also if a folder has multiple Take Lanes, and the folder is closed, click in the space between the plus sign and the folder icon and then choose Tracks / Copy Track Name(s) to Clip Name(s). All the Take Lane clips will be named based on the Take Lanes they’re in. Finally, applying the copy name operation applies to all selected tracks. So if your project is an uncurated mess of clips called “Record 4” and “<Melodyne> something”, select all, copy the Track Names, and all clips will have meaningful names. 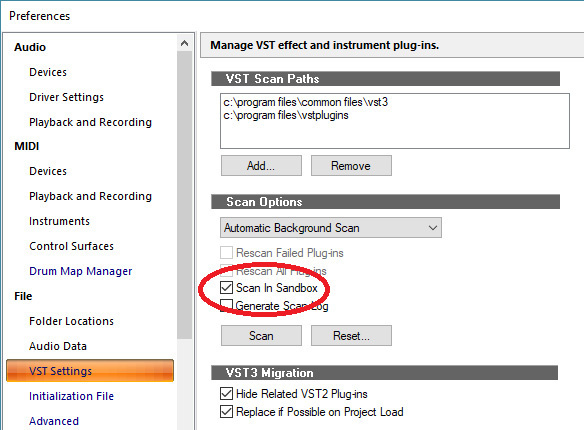 Check ‘Scan in Sandbox’ and you’ll be happier when CbB starts up.Scan In Sandbox: I believe this is enabled by default in updates, but check Edit / Preferences / File / VST Settings to make sure. If you’ve ever watched Cakewalk struggle as it tried to scan a strangely written plug-in, then closed the scan and started over, then closed the scan and started over when it hit another rogue plug-in, keep this enabled. Yes, it will take a little longer in theory — but in practice, you’ll save time because oddball plug-ins won’t stop the scanning process. Note Draw Duration buttons: These have been added to the Piano Roll and Staff views; selecting a new note value changes the Tools module value, and vice-versa. You can enter notes with either the Smart tool or the Freehand tool, but there’s a difference: the Smart tool requires a double-click, while the Freehand tool requires only a single click. If you’ve ever moved your mouse slightly between clicks, and the PRV is zoomed out quite a bit, you’ll know why I always choose the Freehand tool to enter notes. Clean Audio Folder.Clean Audio Folder Enhancements: If you ignored this when you looked over the list of updates, it’s understandable. You probably used it in the past, when it would search your entire computer in geological time. Or maybe you had some media on a removable drive and accidentally nuked important files. No more! You can now clean only a particular project’s folder, which is great. It takes only a few seconds, and clears out a lot of space. Note that you can also audition files before deleting them, in case you’re nervous about deleting something you need. Don’t worry; you won’t. This isn’t the old Clean Audio Folder. 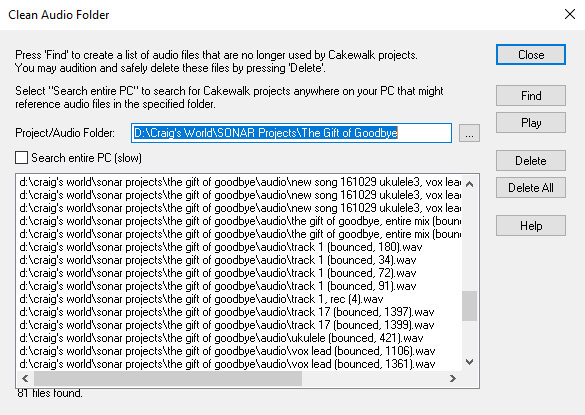 Some people still wonder if they should switch over to Cakewalk, or stick with Sonar. 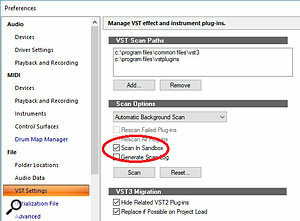 Don’t uninstall Sonar, because you’ll want to keep the plug-ins included with Sonar that aren’t in Cakewalk. But at this point, there’s no reason not to switch. Cakewalk is faster, more stable, and getting more solid with each update. Also, remember that learning a powerful program takes time. Some people have the mindset of “I don’t want to spend time learning, I just want to be able to push buttons and have everything be epic.” Although reality doesn’t quite work that way, spending just a couple of minutes learning some new feature while Cakewalk is open will yield rich dividends after a fairly short period of time. Besides, five minutes spent learning may save you many hours over time.